In Blizzard white. Connects to your network or hotspots on all current Wi-Fi standards. Connect to an HDTV or high-def monitor to set up two screens side by side or just see more of the big picture. 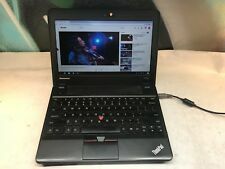 Refurbished Unlocked Lenovo Thinkpad X131E 11.6" Laptop 4GB Ram 16 GB SSD. • All units Have Been Tested. Units are in working condition, we've tested each unit. • 16 GB Solid Sate Drive (SSD). • One (1) HDMI. • One (1) SuperSpeed USB 3.0. • One (1) USB 2.0. • One (1) Headphone & Mic combo 3.5 mm jack. Also subject to change especially during peak periods. • 3-cell Lithium-ion. COLOR: Black. BATTERY HEALTH: GOOD. MTK MT8173. 1366 x 768 ( HD ). Unit may show scuffs or light scratches on housing from handling. Overall looks and runs like new. Regular (Not Backlit) Keyboard. WiFi Module Built-in. Bluetooth Module Built-in. Battery Life Up to 10 hours . 2 x 2W speakers. 32 GB eMMC. 4 GB LPDDR3 1866 MHz. Customizable security features and spill-resistant keyboard add more reliability. Experience faster start up and shutdown with Lenovo RapidBoot technology. Superior web conferencing provide enhanced user experience. 1 Year Warranty, Free Shipping and Free Returns! Solid State Drive: 16GB. Headphone/Mic Combo Jack. Also has very faint keyboard wear. May have very small scratches on the palm rest on the keyboard. This does not affect functions. These have been tested, cleaned, and imaged and are in full functioning condition. 32GB SSD (Solid State Drive). Regular (Not Backlit) Keyboard. WiFi Module Built-in. Bluetooth Module Built-in. 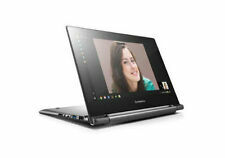 Lenovo Wireless AC (2 x 2) Bluetooth® 4.1. SD support for expandable storage. Battery life based on testing with PLT (power load test). Battery life varies significantly with settings, usage, and other factors. Mfr Part #: 81JW000JUS. Processor Model: M8173C. Screen Size: 14". Check-Out Now! Limited Warranty: 1 Year. AC Adapter. Weight (Approximate): 3.31 lb. Depth: 12.8". CPU Model: Celeron N3350. Hard Drive: 32GB eMMC. We are not an authorized dealer of this product and any warranty included with the product may not be honored by the manufacturer. System Conditions: System passed all testing. Genuine lenovo ac adaptor/power cord. headphone jack. one msata solid state hard drive slot. serial number from one of the units LRV4R5H. built-in microphone. ethernet connector. In perfect mint condition. Used by elderly mother for a couple days, basically new! I loved this laptop, but unfortunately it’s just a little to heavy for my mother’s hands. It does NOT have a touch screen. The cables are still NEW and unused as you can see in the picture. I am also throwing in a FREE Logitech M535 Bluetooth mouse that is open, but also in mint condition that hasn’t been used. I will gladly leave feedback once the buyer leaves feedback. Please feel free to contact me with any questions or concerns. Thanks. EMMC Capacity. 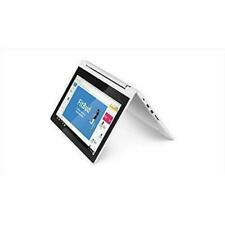 This sleek, stylish, and secure 360˚ convertible is available in Blizzard White. No setup needed—just log in with your Google account to experience a new type of convertible laptop for everything you love to do. Trending at $250.85eBay determines this price through a machine learned model of the product's sale prices within the last 90 days. CPU Model: MT8173C. Hard Drive: 32GB eMMC. our error. We are not an authorized dealer of this product and any warranty included with the product may not be honored by the manufacturer. System Conditions: System passed all testing. 64GB eMMC Storage. Make: Lenovo. 4GB LPDDR3. Q: Are Your Prices Negotiable?. Touchscreen Display. microSD Card Reader. Built for everyday rugged use and long life, the Lenovo ThinkPad X131e is designed for those who need reliable notebooks at an affordable price. ThinkPad X131e is designed to be tough to handle rough use of students and mobile workers. Shock absorption from Active Protection System (APS) provides better protection to HDD against accidental drops. Customizable security features and spill-resistant keyboard add more reliability. Experience faster start up and shutdown with Lenovo RapidBoot technology. Superior web conferencing provide enhanced user experience. Ensure consistent activity with top cover LEDs that indicate wireless connectivity and laptop power or sleep mode. 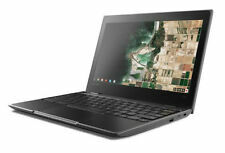 --- Google Chrome OS --- Celeron Dual Core 1.5GHz --- 4GB RAM --- 16GB Solid state Drive --- 720p Camera. 32 GB eMMc. 14” HD (1366 x 768) anti-glare. Up to 10 hours . SD Card Reader. 802.11 AC (2 x 2) Bluetooth 4.1. Battery life based on testing with PLT (power load test). Battery life varies significantly with settings, usage, and other factors. Hard Drive - 16 GB SSD. Each unit is missing between 1-2 keys along various parts of the keyboard. Battery - Yes ( Note: if included, the battery passed limited testing. The laptop runs and functions normally on an AC adapter. ). • 16 GB Solid Sate Drive (SSD). • One (1) HDMI. • One (1) SuperSpeed USB 3.0. • One (1) USB 2.0. • One (1) Headphone & Mic combo 3.5 mm jack. Also subject to change especially during peak periods. • Input: 100-240V, 50/60Hz. P/N: X131e. 16GB Solid State Drive. 4GB DDR3 RAM. Model: ThinkPad. Three (3) USB 3.0 ports. One (1) HDMI port. One (1) VGA port. One (1) RJ-45 jack. 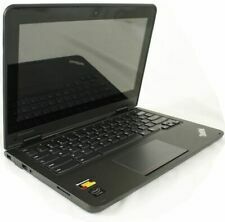 Lenovo ThinkPad X131e 11.6" 16GB SSD/120GB SATA/6GB Ram/WiFi AC/HDMI/USB 3.0/Webcam. Condition is Seller refurbished. Includes battery and charger. Works great. Write protected screw removed so you can install ChromeOS or any UEFI OS. P/N: 81ER0002US. MPN: 81ER0002US. Processor Model: N3350. Product Series: 100e. Product Family: 100e. Manufacturer: Lenovo. Processor Speed: 1.10 GHz. International Orders. 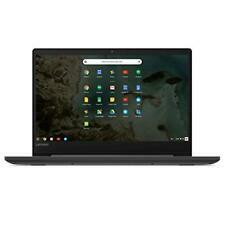 14"Lenovo 81JW0001US Chromebook S330, HD Display, Mediatek MT8173C CPU 4GB RAM, . Condition is New. Shipped with USPS Priority Mail. 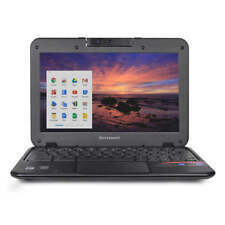 Lenovo N22 80SF Chromebook 11.6" Intel N3050 1.60GHz dual core 4GB Ram 16GB SSD. Condition is used, in great condition with normal wear and tear. Includes charger. Shipped with USPS Priority Mail. Other than that, this laptop has been lightly used and is in very good condition. Power chord included. Moreover, the 2 GB RAM in the Lenovo ThinkPad X131E laptop lets you multitask with ease. What’s more, the Bluetooth 4.0 technology in the Lenovo ThinkPad X131E laptop enables you to wirelessly connect and share data with other compatible devices. Ports:1 x USB 3.0 ports; 1 x USB Type-C port;1 x Bluetooth 4.1; 1 x WIFI;1 x HDMI;1 x SD Card reader;1 x Headphone/microphone combo jack;1 x Kensington Lock Slot. Fast and simple, for daily computing. Its 11.6" display has a 1366 x 768 resolution for crisp and clear HD playback. Other integrated features include 802.11ac Wi-Fi, Bluetooth 4.2, USB Type-A and Type-C ports, a webcam, a microphone, speakers, and headphone jack. From social media management to working on your website, the Lenovo C330 lets you take it all on the go. Wi-Fi and Bluetooth® make it easy to connect to the Web and your peripherals, so you can worry less about having the right cables on hand and focus more on getting things done. 11.6" HD 10-point capacitive touch screen makes it easy to navigate features. Anti-glare screen with 1366 x 768 resolution allows you to view content in crisp clarity indoors or outside, while the LED backlighting promotes a thinner, more energy-efficient screen. Powered by a MediaTek quad-core processor. Play, work and surf the Web. 4GB of memory is available to run your programs and games. Wireless-AC (802.11ac) for high-performance, cable-free networking. Connect to wireless networks to share files, surf the. 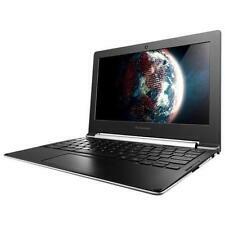 • Lenovo ThinkPad X131e Celeron Dual-Core 1.5GHz 11.6" LED Notebook. ✅ 16GB Solid State Drive. ✅ Color: Black. ✅ Webcam and microphone. 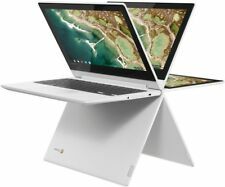 NEW LENOVO CHROMEBOOK C330 BLIZZARD WHITE CONVERTIBLE NOTEBOOK COMPUTER 11.6"